The previous Liberal government in 2005, with much bureaucratic deception, stick-handled the replacement of lifelong pensions with one-time lump sums. Permitted not one second of debate in the House or a House committee hearing, in less than one minute MPs unanimously overturned a nearly 200-year commitment to provide lifelong pensions for disabled veterans with extra amounts for family members. The regulations that fleshed out the details of this lump-sum law would be posted over the Christmas holiday season during an election. In spite of at least one lengthy submission (from me) to amend the regulations, the bureaucrats changed just one word. And the details were stunning. The lump sum “disability award” would in many cases pay out less than 10 per cent of the amount veterans and their families would have otherwise collected under the lifelong pension. Sadly, this pattern of spurning democratic due process for benefits and laws profoundly affecting veterans and their families would be the playbook more often than not over the subsequent 14 years. Although called a “pension,” the disability pension is a payment separate from any lost income. It is a very real and tangible recognition of all the other losses and suffering veterans have endured in sacrificing their well-being and health at the orders of and on behalf of Canada. That suffering by definition is lifelong. Hence Canada’s solemn historical choice to recognize lifelong loss with a lifelong pension. That is also why a Veterans Affairs advisory group on policy emphasized that the Liberal promise must not merely convert the much-reviled lump sum into an annuity. Some further hocus pocus and the bureaucratic magic show would claim it was eradicating complexity by combining six other programs into one, conveniently dropping an important allowance for the most disabled veterans paying, coincidentally, just under $1,150 per month. The bureaucrats and politicians then audaciously marketed the collection of programs as “pension for life.” All of this was then cloaked in the same budget omnibus bill incidentally hiding another law central to the SNC-Lavalin scandal. Meanwhile, Justin Trudeau invoked cabinet confidence to prevent public input on the regulations, while Treasury Board allowed bureaucrats to hide the costing details of this claimed $3.6-billion new veterans’ program from public view. But veterans won’t be so easily deceived. Those who thankfully had the chutzpah to publicly complain about their inadequate lump sums will likewise not be bought off by an “additional monthly amount” that will pay an average of just $120 monthly to less than 60 per cent of lump sum recipients. The remaining 40 per cent of 76,000 veterans will receive nothing. The reality is that any veteran applying for disability benefits under this new plan will on average receive less than those who will continue to be covered under previous programs. The only magic the Liberals will see is how they allowed bureaucrats to pass the wand over an election promise that made not just veterans’ benefits disappear but veterans’ votes for Liberals in the next election. Sean Bruyea, vice-president of Anti-Corruption and Accountability Canada and author, has a graduate degree in public ethics, is a retired Air Force intelligence officer, and frequent commentator on government, military, and veterans’ issues. 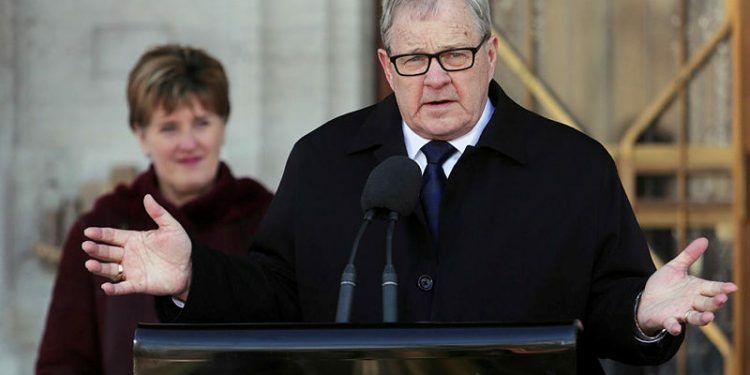 Mr. Bruyea filed a $25,000 defamation lawsuit against now former veterans affairs minister Seamus O’Regan on May 11, 2018, claiming the minister had defamed in a column published in The Hill Times on Feb. 26 2018, which was a rebuttal to Mr. Bruyea’s Feb. 12 column also in The Hill Times. But an Ontario judge dismissed the case, saying the need to protect the freedom of expression is more important than any harm alleged to have been suffered by the outspoken veterans’ advocate, who represented himself in Ontario Superior Court. Mr. Bruyea is appealing the ruling on June 13, 2019, in the Ontario Court of Appeal.